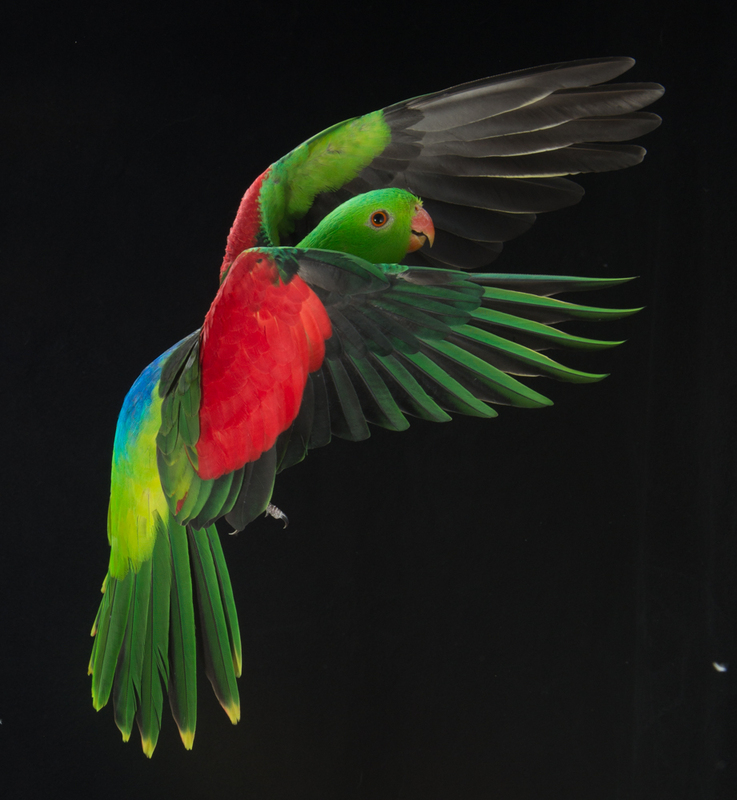 This is the finalpart of the story about how Arwin, a Crimson Wing parrot parakeet, came to Pandemonium Aviaries. Arwin died in early April. To commemorate her life and explain why her death means so much to me, I'd like to share the full story of how she came to Pandemonium Aviaries and what she taught me. In my previous blog about Arwin, I how my attempt at finding a companion for Arwin was not going well and I was afraid that Prince might injure her. I put a video camera outside of their aviary door, focused on their food dishes. The quality was not great, and I couldn’t see every corner of their space, but it enabled me to check on these two frequently. I also put two sets of dishes inside their aviary since Prince seemed determined to attack Arwin when she was eating. She didn’t seem to mind. When he approached the food dish, she would fly to be near him. At first he didn’t tolerate this at all and would chase her away, but by the end of the week, he’d let her stay on the other side of the bowl. By week three they were eating side by side. It wasn’t long after this, that I saw them sitting side by side. I try to clean every aviary weekly. Theirs was very much in need of this since I had avoided entering in order not to disturb the dynamics between these two. I tried to get inside with my cleaning materials, but Prince would not allow it. I realized that he was intent on keeping Arwin and me away from each other. Arwin gave no sign of wanting to assume her normal position on my shoulder, but Prince didn’t care. She and he were an item now, and I was competition. Prince and Arwin met several years ago. They continue to be as happy together as when they first fell in love. They now live in a large aviary. At times they have shared this with other birds such as Plumheads and Moustache parakeets. Prince doesn’t seem to mind. He has indeed grown into his name: he is gentle, gracious and allows other birds to eat first. His fighting days are over; there are no signs of the anger that used to be so noticeable. I once put a gorgeous single Princess of Wales in the same aviary with him and Arwin. Afterward I worried that this might have been a mistake. One never knows before hand about the dynamics of bird society. My concern was unfounded. Prince never even glanced at the other bird. He had eyes only for Arwin, his soul mate.